thanks for feed back. um. i should have let the tire pressure down for sure. just didnt really think of it. also i did try reving it harder and just dumping it... didnt work. it would do a little screech like it was gonna grab. then start frying 1 wheel for ages. hence why i was running 17 sec passes on my new tires. once i put the 15's on it was good. instant traction. but only got 2 runs on them and they were both in the 15's was pretty happy. Last edited by 4BangN; 26-08-06 at 18:20.
brand new vz ss i think. arent they gen 4 ? ****s me was a family car tho . just some older guy goin down for a bit of fun. gen 3 or gen 4 i dunno. Well done mate. Youve got those 60ft times around the wrong way though, you ran the 2.41 on the 15.993 pass and the 2.24 60ft on the 15.815 which would make sense. bit of an improvement i thought. from 16.2 to 15.8 with no real changes to the car. Last edited by 4BangN; 29-08-06 at 06:28. Oh not at all 4bangn, wen i raced my mates vl ever change ( i was flat changing he wasnt) i would get like half a car on him! It is noticably quicker! haha yeah they did nick!! flat shift? as in no clutching? How do you guys get into the 15's? I whacked on a Gtech the other day and had a go with that. I dont know if they are accurate or not but i had two little street runs. First one was 17.51 (launching at 2500rpm) and the second one was 17.01 (launching at 3000rpm with no spinning on 225's) both times with another person in the car with me and i was changing at 5000rpm every change. The changes are a bit slow though cause the box crunches at times going from 1st - 2nd. I've got exhaust, extractors and xf t/b. I was a but unimpressed with the times, but maybe the Gtech might not be accurate? I should just not be lazy and take it out to the strip. depends on the person you talk too! Some people will say it is when you get the rev's right and dont use a clutch, where as i see it you dont take your foot off the accelerator and jab at the clutch to change gears quickly. Dunno what happened there. Gtechs are very accurate. Accurate down to .2 of a millisecond. Put your car on the dyno and check your RWKW figures. lil_timmy take it too the track. the g tech is acurate but the street isnt. i know my car was so much quicker down the strip than it is on the street. i know on the street i spin up to 3rd and on the track i span for like 3 meters. Yeah i plan to take it out eventually. The road was a tiny bit bumpy so maybe that threw it out a bit? Who knows, i'll just need to take it down the strip for a real time. What rwhp does the Gtech read in your car? I wanted to know if these things can accurately measure horsepower or not. It's been a while since i used mine but it was pretty close though. I'll give it a whirl again oneday. Just done like 1/4 mile and 0-100.
flat changing is slow in my car . takin my car down the strip this week its a auto 3 litre with extractors,2.5 inch exhaust,hi flow cat,cai,k and n air filter and advanced timing hoping for at least high 15s im not sure if i should just leave it in drive and maybe stall it ,or shift manually and maybe stall it what do u reckon will get a quicker time? 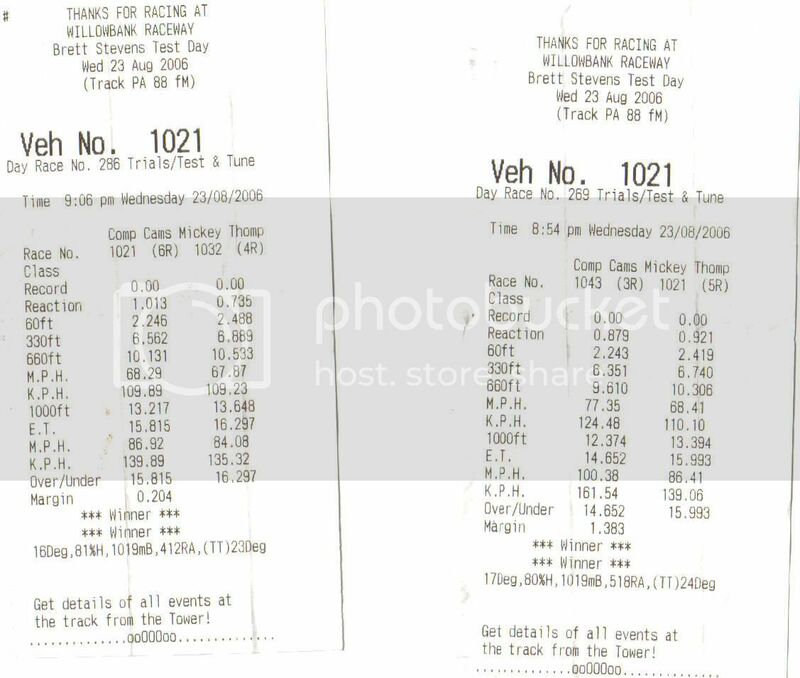 i took my car to the drags on wednesday first time ive raced there the best i got was a 16.025secs at 86.04mph-138.46kmh that was stallin it of the line (auto) and manually shiftin the first 2 passes it spun of the line then i let the tyres down more and it didnt lose traction at all,im so annoyed that i didnt get a 15 but i reckon i will next time, the cars not stock ive got genie extractors,2.5 inch exhaust,hi flow cat,cai,k"n air filter,advanced timing,and i ran it on premium unleaded with 15 inch pursuit rims i reckon its good for a 15 so hopefully i can get 1 next time.